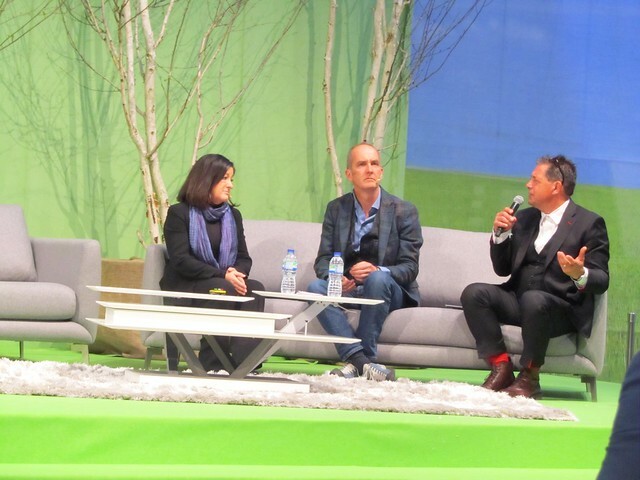 This year I signed up to lots of London trade shows like The Ideal Home Show and Grand Designs Live, due to my increasing interest in homeware and interior design. Everyone has their own opinion, but if I had to recommend one of the two shows over the other, it'd be Grand Designs Live over The Ideal Home Show. Ideal Home to me just felt really manic and crowded, as it was situated in a smaller venue with what felt like many more stalls and exhibitors. 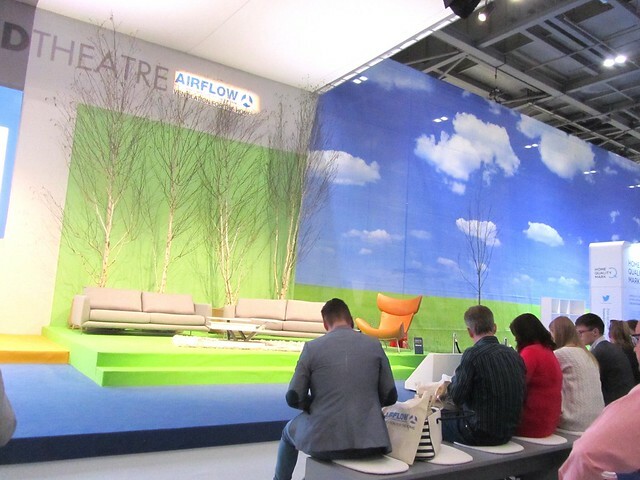 Grand Designs Live on the other hand is a much bigger venue, a lot more spaced out, and didn't felt quite as busy. For those of you not familiar with Grand Designs, Grand Designs is a show on Channel 4 here in the UK which focuses on self build projects where people create their dream homes from scratch. 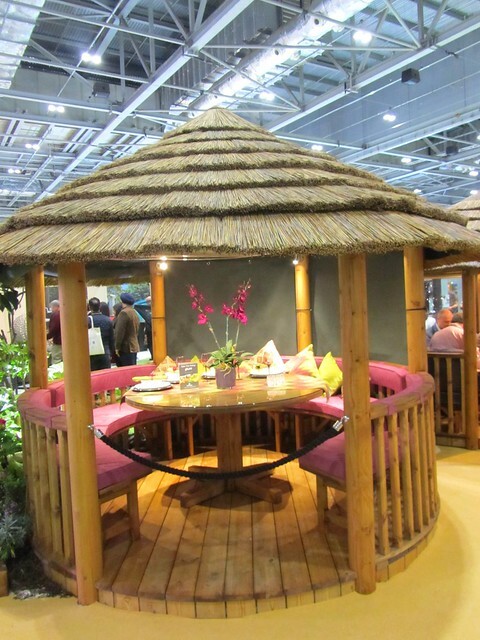 Although the exhibition in London, had some stands focused on building your own home, there were were plenty of other stands with furniture, interior design and etc suited to people like me who don't have the funds to be building their own home! By the end of the day, we'd found some kitchens and furniture we really liked, so took pictures of them and brochures for future reference. 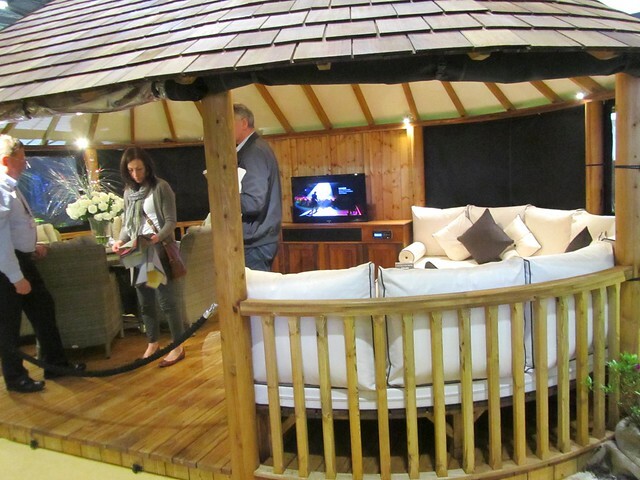 One of my favourite things I saw were these quirky little garden huts, perfect for entertaining in the warmer months. 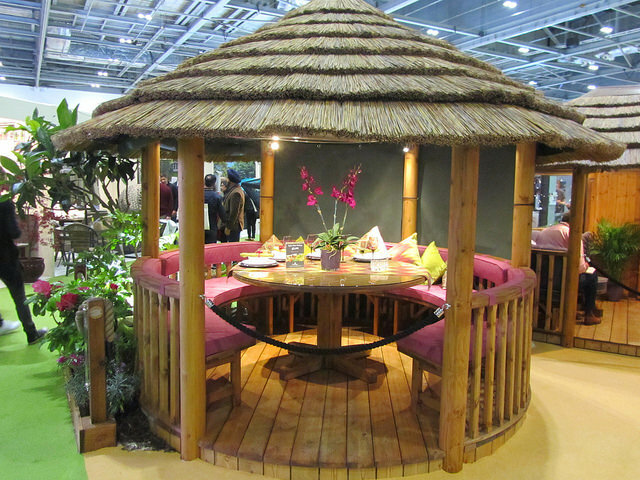 Most designs had straw roofs with sides you could pull down in wetter weather. 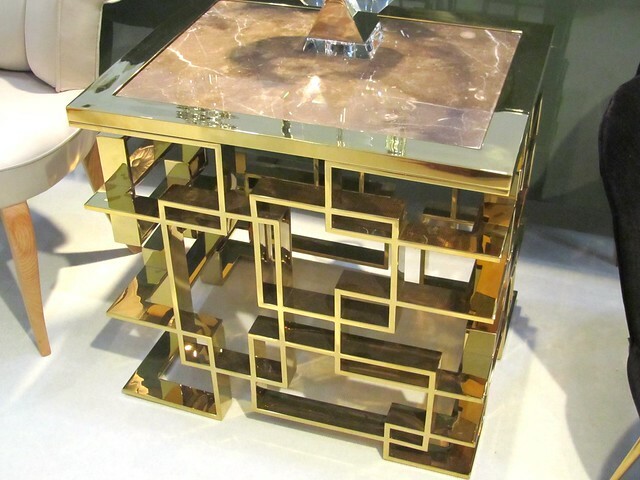 These came in a variety of different sizes - the largest being like a mini living space where you had two separate sides, one for dining, one for lounging with space for a pretty epically sized TV. 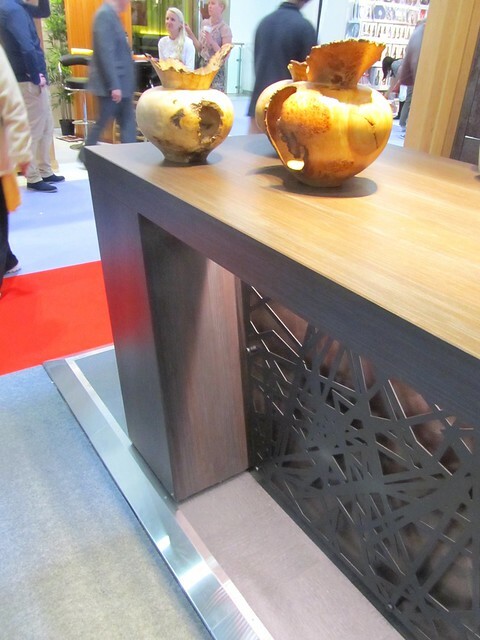 One of the exhibitors was a French furniture company that did the most ornate pieces, with amazing geometric shapes included in their designs. 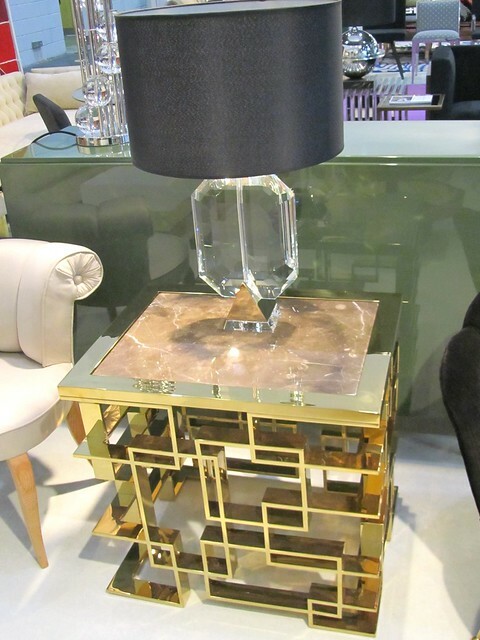 We especially loved the glass topped and chrome legged hallway table and these gold tables which wouldn't look out of place in either the lounge as a coffee table or in the bedroom as side tables. Our other favourite kitchen used different types of wood - our favourite being the darker mahogany - with an interesting sketched / graffiti type overlay to the front of the island (as below) which reminded us of the decor of this hotel we stayed in. 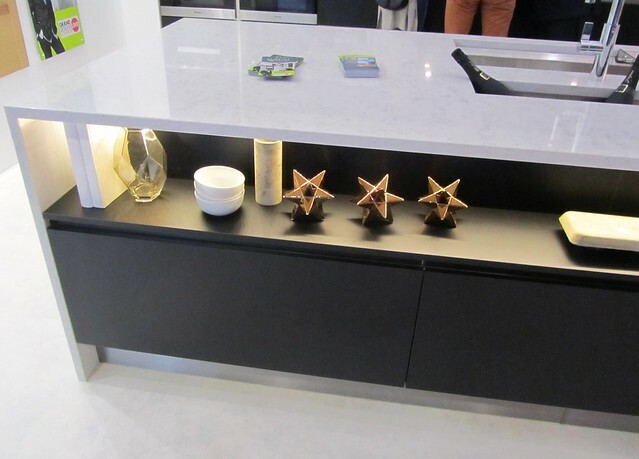 We really liked these white cabinets with the glass shelves, lighting inside, and the mirrored backs. 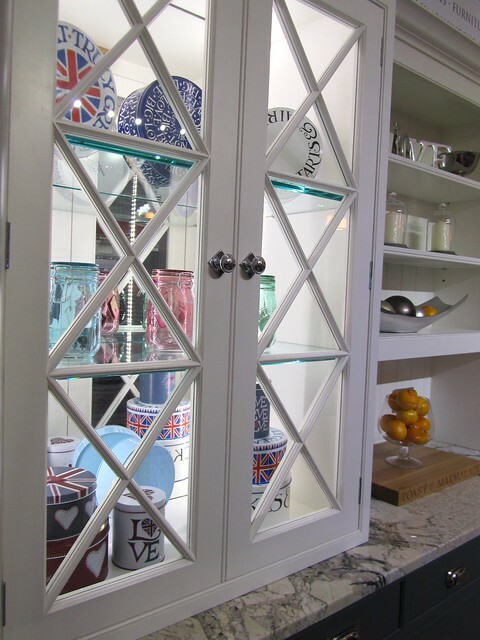 The mirrors reflected the light really well and would be the perfect way to store your finest crockery. 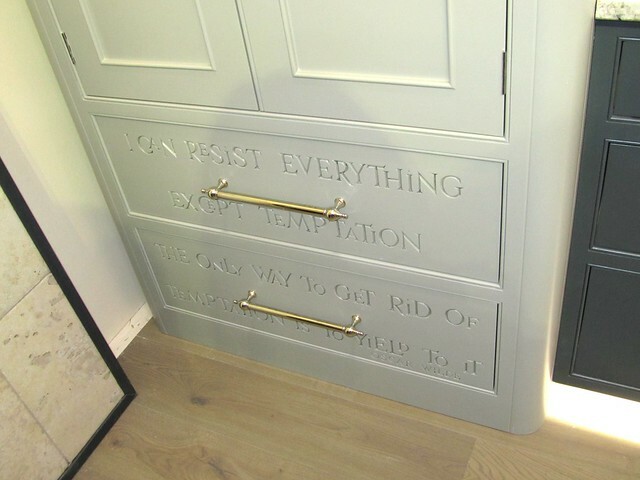 Although we probably wouldn't choose to have have drawers like these in our kitchen, I did like the idea of having quotes etched into the doors, and a designated biscuit drawer! 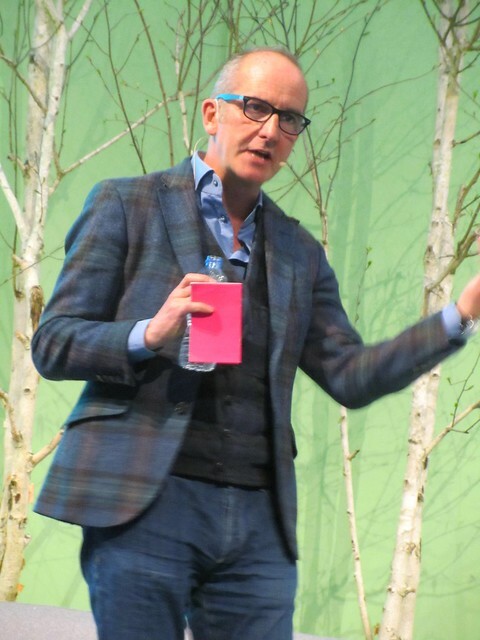 The main face of the show was Kevin McCloud, the presenter of the show by the same name. However as with the Ideal Home Show (where there were different celebrity 'faces' to endorse separate areas of the show e.g. 'garden' 'DIY' etc, but who physically weren't there), we didn't expect to see Kevin there. 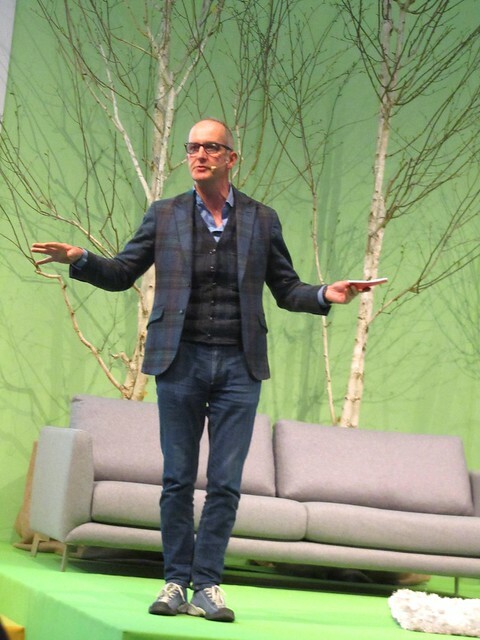 But as we went on the very first day the show opened, we were lucky to catch him giving a talk on the RIBA House of the Year and a sneak peek into one of the newest shows he had filmed. On Grand Designs the TV show, he always comes across as passionate about architecture and very knowledgeable about the self build process. In person this came across equally well. I really liked one particular quote of his, where he compared going to see the different builds on Grand Design to going from restaurant to restaurant for a different meal - but without the digestion. Afterwards he and the panel answered people's questions about architecture and self build projects. I really liked how the stage was set up with bold beautiful colours, and brought the outdoors inside. 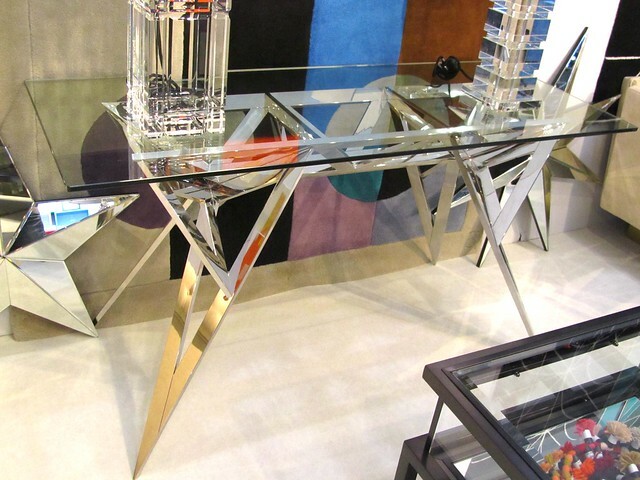 Grand Design Live is on its last couple of days now. Adults tickets cost £20 on the door, but you can get them slightly cheaper online at a favourable advance purchase rate. 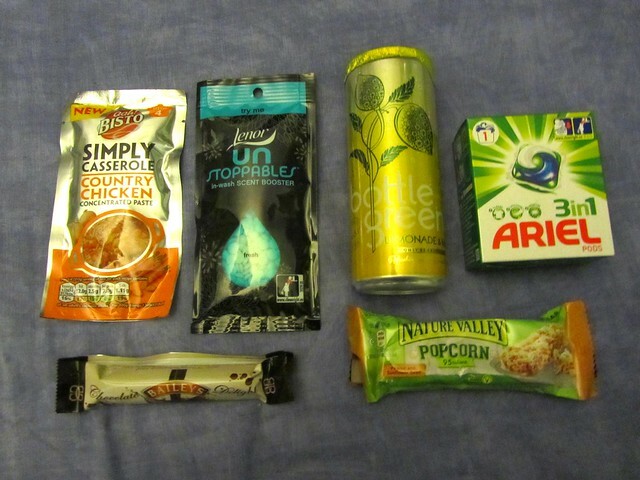 There isn't much in the way of food inside the venue, however there are lots of wonderful food places in the Excel centre itself, so as long as you get your hand stamped, you can go in and out of the show as much as you like! In summary, I really recommend the show - in fact I'd recommend it over The Ideal Home Show - and have been raving about it to all my friends and family ever since. So yep, definitely worth a visit if you're in London over the next couple of days! My fiance's parents are the biggest grand designs fan so they would've loved this. 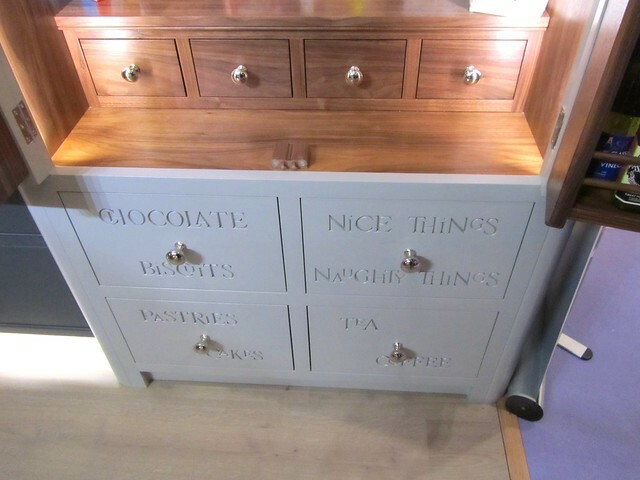 I adore the cabinet with the choc and biscuit cupboard, so cute!